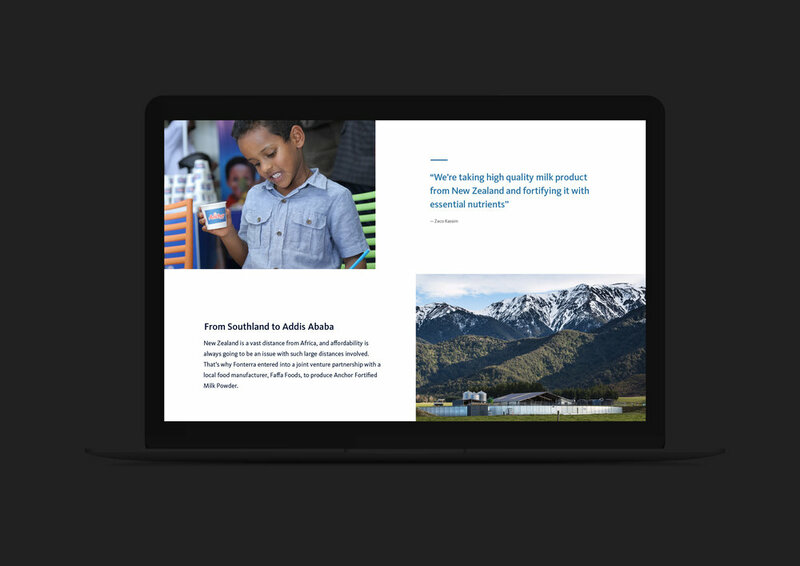 UX / UI, Interaction and Article design for Fonterra, New Zealand’s biggest company. Fonterra wanted to show how small-town Kiwi innovation has improved health and nutrition all over the world. Our job was to reinforce the new brand platform, “From Here to Everywhere”, in a way that was both mindful of the subject matter, “global innovation”, and immediately accessible to a wide audience. A strategic imperative was to show that New Zealand dairy innovation is “everywhere” in the world. To communicate that in a way that was immediate and powerful, we placed every story on a dynamic spinning globe. Built in 3D with WebGL, visitors interact with the world by spinning, clicking and exploring. Unusually, this animated globe navigation is as exciting on mobile as it is on desktop, a fact supported by site analytics and story dwell times on mobile.